The holidays are a season for giving and joy, snow and everything else that makes this time of year magical. Our friends at 1-800-Flowers had the same ideas as us, and so we partnered with them to bring you a whimsical chance to save 15% off your order with our Vouchercodes exclusive code. Get ready to Google some eye-popping bouquets and be frugal all at the same time! I have fallen hard and fast for this Fields of Europe small bouquet and I’m already picturing it sitting in the center of my dining table. 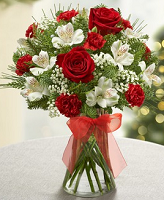 Made locally at your florist and delivered straight to your door, no hassle on your part is necessary. Impress those relatives that are coming over with a beautiful centerpiece and tell them that you did it all by yourself. Ranging in price, there are 3 sizes available: with the small one priced at $39.99. Our exclusive code makes that even more impressive by dropping it to $33.99, giving you that much more wiggle room in your budget for your favorite people at VoucherCodes.ca.